In honor of Skyfall, and the idiotic biometrically tagged PPK/S (great idea…when it works…), here’s the weapon Bond should be using when undercover (if we’re sticking with Walther.) I’ve shot one of these and was shocked by how accurate it was out to about 15 yards and how controllable, despite the low weight. 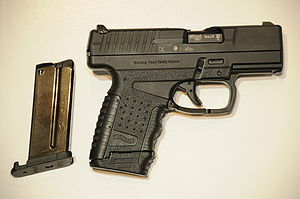 Introduced in 2007, the PPS (Police Pistol, Slim) is one of the smallest 9mm self-defense guns available. Weighing in at 19.4 ounces unloaded, having an overall length of 6.3 inches and 5.9 inches from bottom of the large magazine to top of slide, it is easily concealable, powerful, and very accurate. Unlike the PPK, the PPS is highly reliable. The magazines come in 6, 7, or 8-rounds — the six round lies flush with the grip and is best for concealment, the eight best for grip and control. PM: +1 S/R: 2 AMMO: 6 DC: F CLOS: 0-3 LONG: 8-14 CON: -3 JAM: 99 DRAW: +1 RL: 1 COST: $600 GM Information: The stats are for the 6 round magazine, the 7 and 8 round raise the AMMO appropriately and lowers the CON to -2. There is a .40 S&W with the same stats, but has a 5, 6, and 7 round magazine.